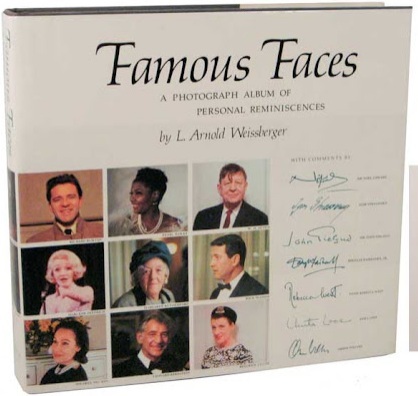 I was drawn to a window display at a used book store in Hillcrest (San Diego), which was featuring a pristine copy of Famous Faces (1973), a six pound coffee table book containing 1500 photographs taken by L. Arnold Weissberger. I had never heard of him. I bought the book and upon my return to Washington DC fired up the computer to learn something about the author. Turns out that Weissberger, who was not formally trained as a photographer, never used a flash when taking pictures of his friends, all of whom were celebrities in the entertainment field. The book of photographs is a “who's who” of celebrities, and there are comments by Sir Noel Coward, Igor Stravinsky, Sir John Gielgud, Douglas Fairbanks, Jr., Rebecca West, Anita Loos, Orson Welles and many more. I discovered that entertainment lawyer Arnold Weissberger (1907-1991) and his life partner, theatrical talent agent Milton Goldman (1915-1989), were popular hosts known for throwing parties for A-list stars. Arnold was more than likely their lawyer, and Milton their source of jobs. Milton Goldman was vice president of International Creative Management (I.C.M. ), and head of its theater department. His clients included such luminaries as Helen Hayes, John Gielgud, Laurence Olivier, Arlene Dahl, Maureen Stapleton, Mary Martin, Christopher Plummer, Lillian Gish, Hildegarde, Vanessa Redgrave, Albert Finney, Ruth Gordon and Peggy Ashcroft. Goldman was also president of Martha Graham's Center for Contemporary Dance and served on the boards of other nonprofits. He served as father confessor, rabbi, psychiatrist, and best friend to many of the top stars he represented. Attending the theatre up to five times a week, he was always on the lookout for new clients. His weekends were devoted to reading and casting new plays. When Milton met theatrical lawyer L. Arnold Weissberger, a relationship began that lasted thirty years. It was a wry coincidence that Arnold’s initials spelled LAW. Arnold was in partnership (as Weissberger and Frosch) with Aaron Frosch, who was executor of Marilyn Monroe’s will. Brooklyn-born Weissberger represented artists and theatrical personalities the likes of Otto Preminger, Martha Graham, Igor Stravinsky, Helen Hayes, Ruth Gordon, Laurence Olivier, David O. Selznick, Orson Welles, Placido Domingo, Truman Capote, George Balanchine, Carol Channing and Garson Kanin. Note the intentional overlap with many of Goldman’s clients. Arnold, an avid art collector, was almost never seen without a white carnation (to match his white moustache) in the buttonhole of his suit’s lapel, and he was seldom seen with his jacket off. He spoke with an upper-class Boston accent, acquired by spending seven years at Harvard. Arnold and Milton entertained at their apartment on East 55th Street, between First Avenue and Sutton Place, before moving to 45 Sutton Place South. It was at the latter address that their entertaining took on a two-tier style, when they began holding separate A-list and B-list parties. They also entertained at their ocean-front weekend home in Seacliff, Long Island, but they had almost daily business lunches at the Four Seasons restaurant when in residence in Manhattan. During the summers Arnold and Milton sailed to England on the Queen Elizabeth II and always took the same suite at London’s Savoy Hotel, usually for a month. The living room, which directly overlooked the Thames, was equipped with a grand piano. Thus their penchant for hosting stellar parties continued unabated. When Arnold Weissberger died in 1981 at age 74, three days after returning from a vacation in Acapulco with Milton, Goldman was not mentioned in his New York Times obituary. However, when Goldman died eight years later, the NYT obituary stated that, as a young man, “he worked 10 years in the family’s gas station and then met the theatrical lawyer Arnold Weissberger, and began a friendship that lasted 30 years, until Weissberger’s death.” Milton had told this story to all of his close friends: when Arnold had pulled into his father’s gas station decades before, Milton pumped the gas – and they had lived happily ever after. Today the Williamstown Theatre Festival administers an annual L. Arnold Weissberger Award that recognizes excellence in playwriting. The recipient receives a $10,000 grant, and the winning script receives a reading produced by the Williamstown Theatre Festival, of Williams College in the Berkshires (western Massachusetts), as well as publication by Samuel French, Inc. Totally enjoyed this piece... I couldn't find any pics of either of them online. Love portraits and ordered a used copy of the book on Amazon this morning. Having been lucky enough to know Arnold, I enjoyed reading this piece. When I was a young struggling lawyer in NYC, Arnold use to send me clients who needed a courtroom lawyer. Arnold was not a litigator and he referred any number of his notable clients. It was good for my practice and my reputation as I was often seen lunching downtown with one of Arnold's gorgeous film star clients. Milton was my agent for several years when I was a child actor on Broadway in the early '60's. He was a class act and always looked out for your best interests. He was old school - you don't find them like that anymore! I was an agent at the Ashley Famous Agency and ICM in the 1960s and 70s and Milton Goldman was a true original and a friend. He was the last of the great theatre agents. Like they say " They don't make them like him any more " I was proud to know him. Milton Golman was one of a kind. I worked as an agent in the 60s and 70s at Ashley Famous Agency and later at ICM. We won't see the likes of him ever again - a true original. I was looking something up and I happened upon your site. I want to make a minor correction. The initials of L. Arnold Weissberger were not a "wry coincidence." His mother put the L in front because she wanted him to become a lawyer.